Israel's Left is circling the wagons around two of its own. 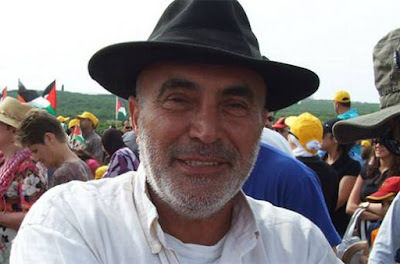 Ta'ayush's Ezra Nawi (pictured) and B'Tselem's Nasser Nawaja were shown on Israeli television on Thursday night telling a Right wing activist with a hidden camera that they turn over 'Palestinians' who wish to sell land to Jews to the 'Palestinian security forces' for torture and death. Although the story has gotten little exposure outside of Israel, here it's all the rage. Over the weekend, Israel's hard left has been circling the wagons to defend Nawi and Nawaja. Both Nawi and Nawaja are among the most internationally renowned members of Israel’s radical left. Earlier this year, Nawaja published an anti-Israeli op-ed in The New York Times, accusing the Jewish state of “dispossession and oppression.” Nawi is considerably more prominent: when he was arrested, in 2007, for attacking Israeli policemen during a West Bank demonstration, more than 20,000 people—including a long list of prominent Israeli academics as well as progressive American celebrities like Noam Chomsky and Naomi Klein—signed a petition demanding his release. These revelations comes at an inopportune moment for the two NGOs, as the Israeli government is considering measures to regulate non-profit organizations receiving financial support from foreign governments. Ta’ayush, according to the Jerusalem-based group NGO-Monitor, receives some foreign donations but does not disclose its funding. B’Tselem, on the other hand, is considered one of Israel’s leading civil rights organizations, and receives financial support from the governments of Sweden, Switzerland, Denmark, the Netherlands, Norway, Germany, France, and the United Kingdom, as well as the European Union and the New Israel Fund. The pushback from the Left has been so fierce that even journalists like Maariv's Ben Caspit and Haaretz's Barak Ravid (both Leftists themselves) have criticized the Left wing organizations for not disavowing Nawi and Nawaja (links in Hebrew). Of course, then there are the real Jew haters, like Gideon Levy, who still has a platform at Haaretz. In a report on left-wing groups which operate in the West Bank, Uvda aired secretly recorded footage of Israeli activist Ezra Nawi saying that he had exposed Palestinian land brokers who sold West Bank land to Jews, and turned them over to the Palestinian Authority.The right wing and the settlers celebrated the event of course. Another outpost has fallen into their hands. They have already compared the left-wing activist Nawi to the Duma murderers, no less. The rightists and settlers, known for their deep concern about the lives of Palestinians, were shocked by Nawi’s statements. But the right is not the story. The story is how a lethal virus has penetrated what is almost the last outpost of real journalism. How has a McCarthyist right-wing organization, whose motives are clear (and despicable) and whose sources are unknown, succeeded with such ease in enticing such respected journalists as Ilana Dayan and Omri Assenheim? How has this flagship joined the ranks of the false propaganda which masquerades as journalism? That is how to conduct delegitimization. That is how it is done to liberal organizations in the darkest of regimes, and now here too, and on Uvda – no less. Presenting the human rights organizations as dangerous groups, and penetrating them, is compared to penetrating ISIS. The McCarthyists are glorified, depicted as heroes of Israel who excelled in battles in Gaza. All these are well-known ploys. And against this background, all that is left is to record Nawi boasting, to catch him uttering the taboo words, to present him as a “senior” activist, to ignore the entire context — the crimes of the occupation and the expulsion form the Southern Hebron Hills, which you never heard about on Uvda. Just ignore the holy work done by left-wing activists in this battered region, spice it with a few lies such as “execution” by the Palestinian Authority, add a few generalizations, suspicions and slander – and the dish is ready. To those of you with even the slightest suspicion that Levy is onto something, I suggest that you go watch the video of Thursday night's broadcast (it's in Hebrew only, but I summarized it here). It doesn't get much more clear cut. Nawi and Najawa turned 'Palestinians' who wanted to sell land to Jews ('Palestinians' whose existence the Israeli Left denies) over to the 'Palestinian security services' for torture and murder. And they did it with a sadistic smile. It doesn't get much more disgusting. Why is the liberal left against Israel in the United States? I know this article was talking about Israel but it seems backwards in the US. Most of the Jewish population in the US votes democrat but democrats oppose Israel in a lot of their stances. It's very confusing.